Click the following link to download your registration form! You can pre register or register at the door! Ages: 2-15 of all levels WELCOME!!! 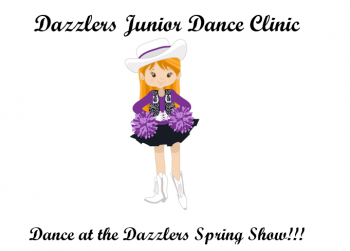 Includes: Instruction, Dance Technique, a Dazzlers Junior Clinic T-shirt, and the opportunity to perform with the Dayton Dazzlers at HOMECOMING!!! Parents: Please return promptly at 11:30 to receive important information about the Junior Clinic Homecoming performance. There will also be a special performance of the Clinic dances. Questions??? Contact Dazzler Director, Shayann Johnson at shayann.johnson@daytonisd.net.